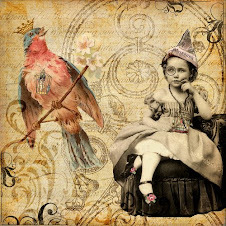 Song Catcher Girl: Songcatching Moonbeams! I am completely in love with Elizabeth Mitchell's music for children these days. I found her music on cdbaby.com as one of the top selling independent children's artists, and I can see why she has found success! Mitchell's last album, you are my little bird, is sold through the Smithsonian Folkways Recording site. Mitchell's gentle acoustic sound and simple renditions of traditional favorites are just what kids need to hear in these days of over digitized existence. I also recently discovered Renee and Jeremy! 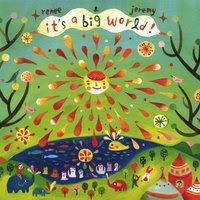 it's a big world is a collection of songs for all ages. This CD is well loved in my home! 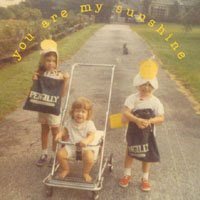 "While we set out to make a record for our little ones, mostly written while renee was on bed rest with amelia, and recorded in the recording studio we set up in amelia's bedroom, we really ended up making a record for ourselves & other parents like us. We welcomed a range of mood and melody from bright to dark, silly to stark, and influence from all our heroes of song, from drake to joni to marley."